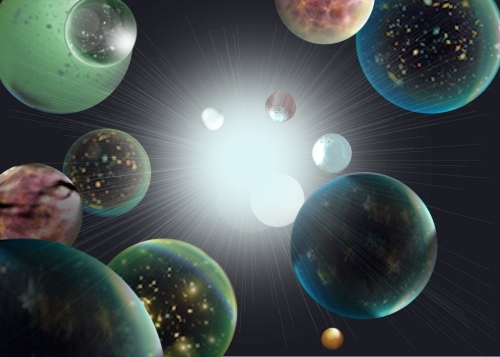 The idea of parallel universes basically says that space is so big that the rules of probability imply that surely, somewhere else out there, are other planets exactly like Earth. In fact, an infinite universe would have infinitely many planets, and on some of them, the events that play out would be virtually identical to those on our own Earth. We don’t see these other universes because our cosmic vision is limited by the speed of light — the ultimate speed limit. Any universe that physicists can get to work out on paper would exist, based on the mathematical democracy principle: Any universe that is mathematically possible has equal possibility of actually existing.